NOTE THAT THE LEAVES ARE ALL OPTIONS, DEPENDING ON HOW YOU WANT TO MAKE IT BUT I WILL TELL WHEN A PARTICULAR LEAVE CAN BE APPLIED. 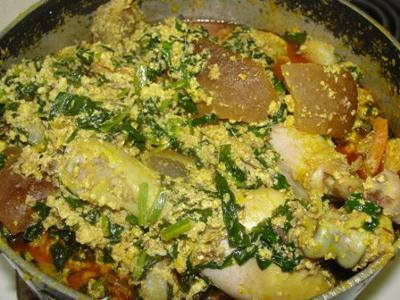 YOU HAVE THE OPTION OF EIDER FRYING YOUR Melon before you grind and apply to the SOUP, OR YOU GRIND THEN YOU FRY OR BLEACH (AS SOME PEOPLE CALL IT) PALM OIL, APPLY A LITTLE ONIONS AND THEN POUR THE BLENDED EGUSI INTO IT, OR IN SOME CASES APPLY THE EGUSI DIRECTLY INTO THE POT WITH THE PROTEIN. IN THE LATER CASE YOU LEAVE IT FOR LIKE A MINUTE BEFORE YOU POUR INTO THE POT WITH YOUR STEAMED PARTICULARS. ADD CRAYFISH AND YOUR DRY FISH ,ALLOW IT TO STEAM FOR SOMETIME,NOT TOO LONG THOUGH, TASTE TO BE SURE YOU HAVE THE RIGHT PROPORTION OF SPICES, THEN YOU APPLY YOUR VEGETABLE, NOW SOME PEOPLE USE BOTH WATER LEAF AND PUMPKIN, SOME PEOPLE JUST APPLY PUMPKIN, WHILE IN THE CASE WHERE YOU USED FRESH FISH TO COOK, MOST TIME CRAYFISH MAY NOT BE NECESSARY WHEN IT IS FRESH FISH, IT COMES OUT WELL, AND WHEN USING FRESH FISH IT IS BEST TO FRY THE EGUSI IN PALM OIL AND USING SHRIMPS WILL EQUALLY BOOST THE MEAL WHEN YOU ARE USING FRESH FISH TO MAKE EGUSI SOUP. IF YOU APPLIED YOUR EGUSI DIRECTLY PLS DONT FORGET TO ADD PALM OIL either BEFORE PUTTING THE VEGETABLE OR AFTER, I LIKE BEFORE SO THAT THE VEGETABLE WILL STILL BE KINDA FRESH. TO ACHIEVE LUMPS IN THE EGUSI WHEN YOU POUR YOUR MELON INTO THE POT WITH THE PROTEINS DO NOT STIR IMMEDIATELY, ALLOW IT STEAM FOR SOMETIME BEFORE STIRRING.